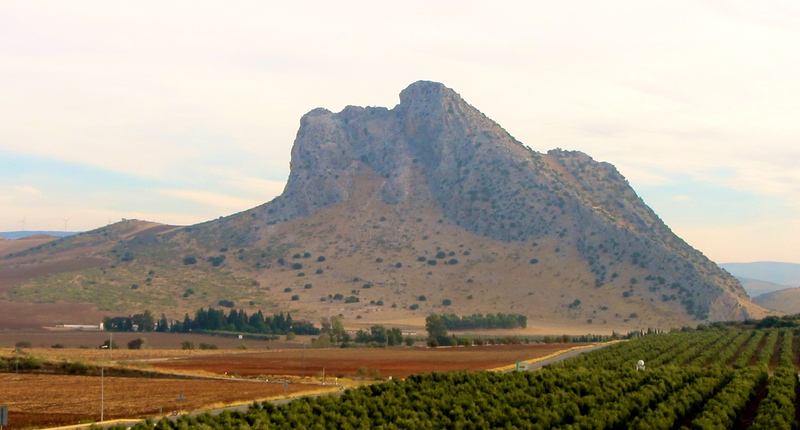 Near to the city of Antequera in Málaga Province is Peña de los Enamorados (The Lovers’ Rock), which rises 880 metres above sea level. This mountain is more popularly known as “Montaña del Indio” because it looks like the head of an Indian when seen from certain angles. I think it looks like the stone face of a sleeping giant. Can YOU see the “sleeping giant”? This entry was tagged Andalucía, East of Malaga, Europe, Malaga, Málaga Province, photography, Spain, travel. Bookmark the permalink. I see the sleeping giant and the Indian head – a majestic mountain. Where I come from there is near Burning Mountain the Wingen Maid, which resembles a reclining woman. The shapes and names of such things very much appeal to my imagination, still. Oh my gosh, how weird! I did not see the face until I read the post. Now, I am all creeped out. Wonder if he is gonna wake up??? I saw the profile of the face before I started reading. Doesn’t really look like an Indian’s but yes I agree, I do see a giant! Thanks for your visit Amelie – always much appreciated. Surely it all depends what kind of “Indian” you mean! He looks like an American Indian – not an Indian Indian…!!! OH yes, I mean an American Indian! Indian. Yes! I could see it right away. Magnificent! Nice take on the challenge! Pingback: Weekly Photo Challenge / B4 Retouch: Grand (Great Pyramid) | What's (in) the picture? I could have sworn I commented on this early this morning? and my “like” wasn’t registered either. I’ve also not been getting my notifications. darn goofy! but, yes, I see the face! When I first looked at the picture, I thought “wow” but didn’t see the giant’s face. But once you mentioned it in your post, I could see it easily, and now going back to the picture, I can’t see it any other way! Anyway, it’s quite spectacular! It’s funny how that happens, isn’t it? Funny I immediately saw George Washington ! Beautiful region Marianne! I sure see him…what a beautiful piece of nature. This post reminded me of the Glasshouse Mountains in Queensland. When you drive up to it at a certain point one always reminds me of a male gorilla. You can almost see what I mean in this image. What a profile he has! Yes definitely a sleeping giant, hope he doesnt wake up. I used to live in a house which must be around where that photo was taken, what an incredible view to wake up to every day!! Now we are over the other side but can’t see it anymore sadly. Wherever we travel to we always know we are nearly home when we see him!!! Don’t think he does much work, to be honest! OOHHH I’m afraid I don’t know that story, Paddy. I’ve tried to find the poem to which you refer. Can you think of any more information about it? Unless it’s shadow, the giant appears to be smiling. Sweet dreams perhaps? It always makes me smile when people point out similarities between rock formations and people, animals etc. In the Cueva El Aquila in the Gredos Mountains our guide pointed out King Juan Carlos, a Matador and the Virgin Mary but you had to have a very good imagination to make them out. On the other hand I can see a sleeping giant in your picture. I saw one in the USA once which supposedly looked like a sleeping Indian brave but I can’t remember where that was.